The world certainly loves her false gods, and it seems those false demonic gods, the Nephilim, never totally left the scene. Scripture has much to say about worshiping false gods. Indeed the first two commands of the Decalogue are both explicit and implicit that we are to not bow down or make images of other gods. This begs the question, who are these gods? In American evangelicalism I have always heard that today these false gods are money, or any "idol" we put before the Lord in our daily lives. While this is true to a degree, in biblical times the false gods had names and received worship from pagan lands, and sadly often from Israel herself. Both the old and new testament are replete with such false deities. "He casteth out devils through Beelzebub the chief of the devils". "They cried out to the LORD and said, 'We have sinned because we have forsaken the LORD and have served the Baals and the Ashtaroth" (1 Samuel 12:10). "When the Philistines took the ark of God, they brought it into the house of Dagon, and set it by Dagon. And when they of Ashdod arose early on the morrow, behold, Dagon was fallen upon his face to the earth before the ark of the Lord. And they took Dagon, and set him in his place again. And when they arose early on the morrow morning, behold, Dagon was fallen upon his face to the ground before the ark of the Lord; and the head of Dagon and both the palms of his hands were cut off upon the threshold; only the stump of Dagon was left to him. Therefore neither the priests of Dagon, nor any that come into Dagon's house, tread on the threshold of Dagon in Ashdod unto this day. And when the men of Ashdod saw that it was so, they said, The ark of the God of Israel shall not abide with us: for his hand is sore upon us, and upon Dagon our god." Temple of Castor and Pollux in Roman Forum. Photo by Leon Mauldin. We could go on and on with false gods, Diana, Isis, Ishtar, Horus, Osiris, Apollo, Hermes and others spoken of in scripture. "Let no man deceive you by any means: for that day shall not come, except there come a falling away first, and that man of sin be revealed, the son of perdition"
Now, a group of architects, civil engineers, and archeologists from around Europe want to build a modern version of the statue, five times taller than the original. The project website describes "a contemporary 150-meters-tall building which would be used as a cultural center, as a library, an exhibition hall and a lighthouse." The designers want to cover the entire exterior with solar panels to power the enormous building. To ensure that the statue won't succumb to the same fate as the old Colossus, the engineering team says they will use "intelligent systems to prevent the consequences of earthquakes and wind forces." This amounts to building the statue as a tripod structure—two legs and a third support from the sash draped over the titan's arm and touching the ground—and placing a heavy steel support around the base to act as a counterbalance. A suspension system would allow the statue to rock back and forth. 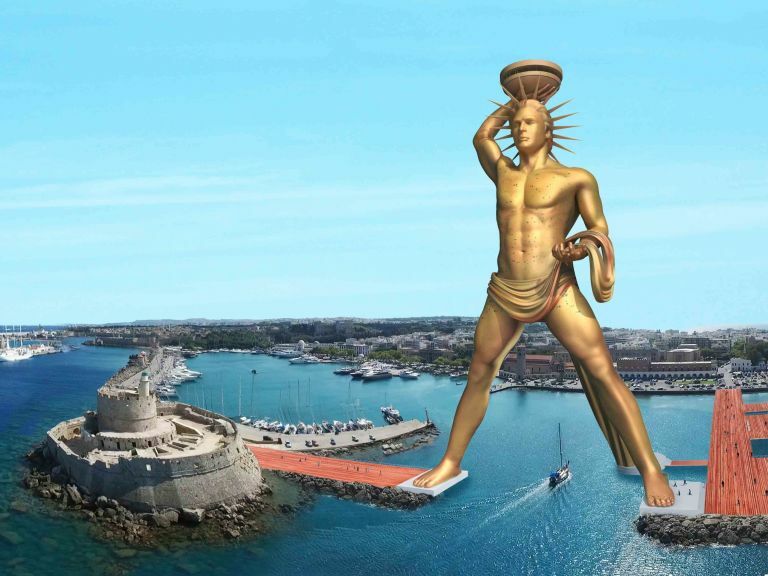 The Colossus of Rhodes Project says in its mission statement that one of the project's goals is to ease the economic hardships that have plagued Greece lately by both employing construction workers and attracting tourists to the island of Rhodes. The planned statue is intended to "put Rhodes again on the world map." The backers estimate the cost of the statue at $283 million. They believe they can raise that much money through crowdfunding and private investments. It's an incredibly ambitious plan to be sure, and we're not convinced that it will ever get off the ground. But if the Colossus of Rhodes is resurrected, sailing into the island's harbor would be the experience of a lifetime—a real life version of cruising into Braavos.